← How to publish CONNECTED SAP Dashboard (Xcelsius) as HTML5 OUTSIDE the mobile app! 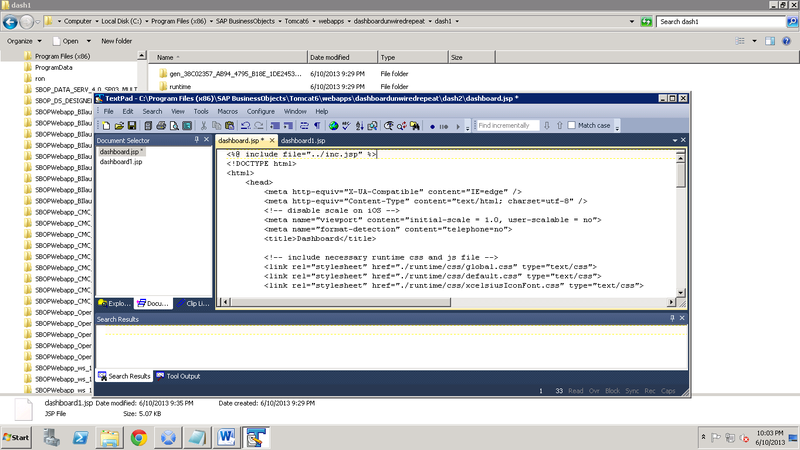 As promised on the last post, you can find below a detailed account of how to get your connected HTML5 harvested SAP Dashboards (Xcelsius) files to work outside the SAP BI App. I tried to strike a fine balance between keeping this to a simple set of instructions and giving enough info for troubleshooting and explanations. This entry was posted in BusinessObjects 4.0, HTML5, SAP Mobile BI, Xcelsius and tagged SAP Dashboard connected html5. Bookmark the permalink. But Will it be Legal using SAP Dashboard with this way?? Thank you so much for this article its so much helpful. in the very last step where we are suppose to find below code in file_2. but i dont see any code like this in my file. can you please tell me what yo do ? what do you mean setting up connection in the dashboard. i previewed the dashboard for mobile. got the files from temp folder. renamed .html to .jsp and made changes in file_1 after beautifying the code. that went well. in the file_2 after beatifying the code i dont see the code which we are suppose to comment out. and yes as of now i am just trying so i havent setup the authentication part. This code gets generated when you use the Query manager in dashboards to connect to a Universe and source data for your dashboard. That is the premise of this example. Thanks. i am using excel as my source data. i am not using bex query or universe. is it still possible to publish the dashboard as html 5 ? If you are not using a universe connection, you do not need to make the changes described in this post to the html5 you harvest from the temp directory. as you said earlier i havent made any changes to any file as excel is my source file of the dashboard. Solved that problem. had to put everything in the other folder and now it works fine. sizing is the problem when it comes to tablets devices so will have to do something about it. I’m having the “404 missing page” problem too. Mind sharing what you did? 1. I created html5 files under temp directory. 3. I opened the dashboard.html file on ipad from Intranet. What I see is just a blank page. What can be the problem and how can I solve it ? Try to open it first using a browser with good debugging toolset (like Chrome, Firefox with Firebug or IE9) to see if you get any errors/warnings. You will probably be able to see the errors on the desktop browser better then with the iOS Safari and once you know what kind of errors are causing the page not to render, you will be able to address. i have prompt in the dashboard, so it queries when loading. I get the error “No network connection. The dashboard cannot retrieve data.”. when the above changes are made to the dashboard.jsp i get “error” JS alert two times before getting the same “No network connection…” alert error. I tried to debug using fiddler/firebug, but not able to get the success response. Even if the serSes is set and the server connection again will be needed for querying, Right? the BO tomcat is working with ssl https://. Can this be due to cross-domain mismatch. Yeah, cross domain was the issue. I added a filter to add the Access-Control-Allow-Origin: * in the response header. Thank You was really useful. Also, directly set the serSes to mySession. working. Thanks for sharing a valuable info. Friend, kindly help me to achieve it in BSP. We have a situation where we want to publish an application to html5 and let the entire world view it on their ipad (via safari) without any authentication. We keep getting stuck on the html5 looking for authentication from BO server. How do we comment that out? We are using a public WSDL data connection. Thanks in advance for any thoughts! Pat — I’m in a similar situation where I still need QAAWS but want to bypass BOE authentication all together (using custom soap webservices outside BOE, using HTML5 components — only data connection available. Has anyone found the ability to go into the RPC directory of Xcelsius and remove the ability to authenticate altogether? I did follow all the steps mentioned above. it gives an 404 missing page. I haven’t modified anything since the source of the dashboard is an excel file. Can you please let me know how to make the url work so that i can show it to my business on their Ipads browsers with out the use of Mobile App. I could not find the “this._ceSerializedSession = this._connectionAPI.getInitParameter(l.PARAM_CE_SERIALIZED_SESSION);” in step 4. Would you mind tell me where is it? Alvis, it’s very possible that different versions of dashboards/xcelsius produce different html/js and that the version you are using is different then the one used to document this method. This post is over a year old, i believe SAP released several updated to dashboards since.. I would like to ask you a few questions about the CONNECTED HTML5 dashboard. how could this HTML file communicate with the REST services in BI 4 to get the token in order to logon to the BO server to retrieve the data on the mobile device. 3.What’s the webapp details? What SDKs jar are required? 4.Would you mind sending me the sample including the webapp. Therefore I could try it on my tomcat. Hi Alvis, thanks for your comment. This post is an illustration, example, of a possible implementation, IT IS NOT a published project that can be used as is, rather it provides guidelines and possibilities for BI Happiness. YOu will have to do the work to adjust it to your specific situation, based on the requirements, environment and software versions that are relevant to you. 1. You can lookup endless number of examples for obtaining token using BO SDKs. In this blog alone, you can search to token and retrieve 8 different posts with example code for token retrieval..
Ron – Awesome post. My team is really excited to try this out. Do you know if a CSV Connector could be integrated with this solution. Yes, non mobile components do not have html5 rendering at all, they are only supported in flash. I will update it to the latest version(BI 4.1 SP6) . A file has a command line moved from file_1.js to file_2.js. Thanks a lot. Could you share the inc.jsp with us?